If someone told me 20 years ago that in 2016 I’d be working as a nurse and happily living 25 miles from the town where I grew up, I probably would have socked them. In June of 1993, I graduated from high school and hustled out of Connecticut with no plans to come back. Acutely aware of – but grateful for – the amenities provided to me by both my parents and the community we were raised in, I was determined to find a place I felt I belonged. My childhood had no shortage of friends or fun, it was nothing if not idyllic. However, the roller coaster of adolescence and a growing discomfort with the value system taught to “privileged” kids led me to believe I needed to get as far away as possible to find myself. I started college in Virginia. The countryside was beautiful and horses abounded, but the mindset conservative and old-school. Next, a brief stop in Massachusetts before throwing caution to the wind and going across the ocean to France. My first job out of college was with an emergency medical assistance company whose reach spanned the globe, and whose American offices were in Philadelphia. Philly is an wonderful city, and arranging medical evacuations was fascinating. A requirement for every Operations coordinator was to speak a minimum of 2 languages, so both the staff and the work were multicultural. Imagine my surprise when I discovered that after 4 years of literature, language, and music study, the single most interesting part of the job turned out to be the medical component. I had tried hard to avoid the medical field. My parents and one sibling are doctors. Since I’m not great at math, I had always assumed I’d never make it through the requirements necessary to enter medical or even nursing school. To top it all off, I was never big on following rules, and medicine never sounded like something that involved a lot of creative interpretation. Little did I know! So, I took a gamble, and applied to nursing schools. A few years later, I graduated from NYU’s school of nursing, which had led me to an adorable apartment in Brooklyn and a solid job at Planned Parenthood. Community and public health nursing were right up my alley. Through some strange twist of fate, I wound up running into and later dating my future husband, who I’d first met in high school. He was based in Stamford, and my future stepdaughter’s mom in Pound Ridge. As things got more serious, we talked about where we might live. I bristled at the idea of returning to Fairfield County. True, I grew up here and can wear a polo shirt and use the correct fork. But concerning myself with that sort of thing is not me. In the major cities of the world, no one bats an eye if you have a nose ring, or a prominent tattoo – let alone assumes that they might be barriers to gainful employment. The suburbs, however liberal, are less easygoing. What about Vermont? I asked Jeff. Great education, job opportunities, and an open-minded hippie vibe. He liked the idea too, but that would mean leaving Lili behind, which wasn’t an option. I agreed to give Connecticut another try. We rented in Fairfield, found neat local kid things to do with Lili on weekends, and looked up some old like-minded childhood friends who’d settled in the area. I left Planned Parenthood and began working for a therapeutic foster care program. Still, I felt like a fish out of water. Even as we started to enjoy the area and branch out a little bit, I wondered if we’d ever find our people. When we bid on and eventually bought a house in Easton, I struggled to imagine us at community events. We sort of blended (as much as the Latino dad and tattooed mom can), but I wasn’t sure we’d ever belong. Cue up a complete mommy meltdown. It was late on a weekend night. There was no pediatrician’s office open to give us a nebulizer mouthpiece. There was no way I was going to drag our poor, exhausted baby back to New Haven to beg for one from the hospital. Earlier that evening, it had taken a solid hour for them to find one in the first place. As a last resort, I made a pitiful plea to the Easton Mom’s group on Facebook. Within ten minutes, NINE local moms – only one of whom I’d actually met – located and offered up the needed breathing apparatus. Several even offered to come drop it off, at 9:00 at night! It was an amazing show of generosity and mutual mom support. T got his meds, I dropped off some banana bread thank-yous the next day, and the universe righted itself. That night made clear that there are good people to be found in this area. Friends who are pet vs human parents have also proved unbelievably supportive and understanding, even of things they are not currently working through. I’ve discovered that some of the people whose paths crossed mine after moving back are even more awesome than I’d remembered. My own parents are close enough to barbecue with on a given Sunday, something that geography alone had made impossible for more than twenty years. We live in a town so safe that the police log is almost exclusively roaming animals or routine traffic stops. 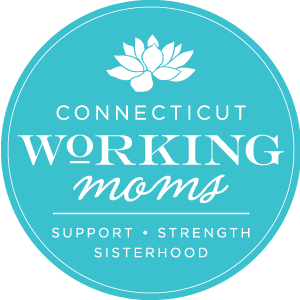 Over the past year, I’ve also met a bunch of lovely Fairfield County-area moms. Motherhood, while very empowering on a lot of levels, is also very humbling. It is not all perfectly edited photos on social media. Sh*t gets real, both literally and figuratively. We get barfed on. Sleep deprivation is cumulative, so before we can recover from labor and childbirth, we have become walking zombies (I believe the term is “Mombie”). Any remaining brain power is used to ensure our newborns are adequately and organically fed, free of diaper rash, safely secured, head supported, etc etc. No detail pertaining to child welfare is missed! But sometimes, when one of us finally arrives at the grocery store with aforementioned perfectly-nourished-and-packaged child, she might look down to find she is still wearing fuzzy slippers. At those moments, it’s nice to have someone who understands to laugh (or cry) with. In the chaos that is parenting, any support is welcome, judgement-free support even more so. Being a parent is hard. Being a mom *and* a wife, an employee, even a good citizen is no small endeavor. Discovering that there are other moms who, despite having their plates already full, remain happy to lend a hand or an ear was game-changing for me. Yes, I’m sure there are judgy, mean-spirited types out here. To my surprise, however, there are far more mutually-supportive, loving women who are focused on keeping their own families afloat, and couldn’t care less if my shirt has a collar (or what might be spilled/smeared on the front). These are my people. And I feel lucky to be raising my kids with them. Love this. I am also a CT local who lived abroad for most of my adult life and swore I’d never move back. Amazing how parenting puts so many things into perspective.